New version of the CC2500 module. 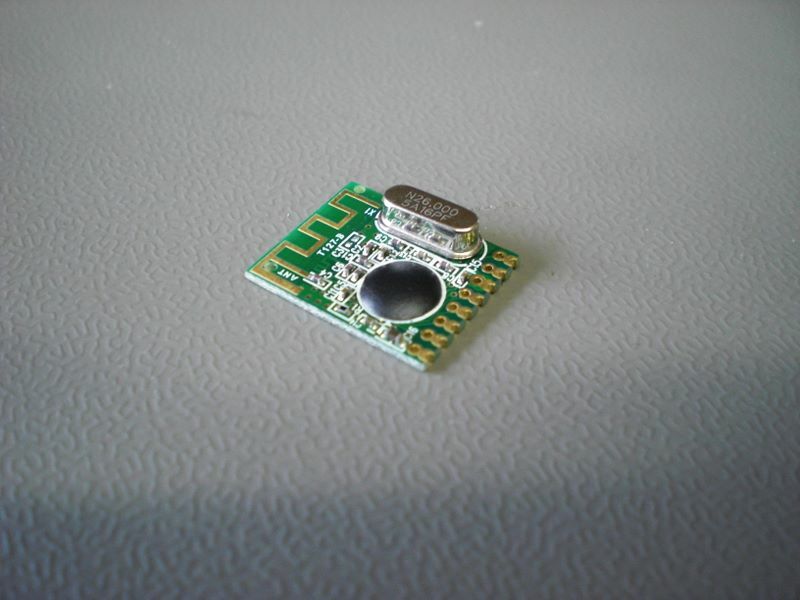 Quasar UK have changed their 2.4 GHz module. The pinout is the same but it is now a SMD device. No need to change the layout. The crystal is thu-hole so there are solder bumps on the back. Author adminPosted on August 14, 2010 December 13, 2015 Categories Kit, Kits, LivingColors Gen1, PCBTags Arduino, Arduino Shield, CC250010 Comments on New version of the CC2500 module. The different iterations of the shields..
4 iterations of the CC2500 shield. 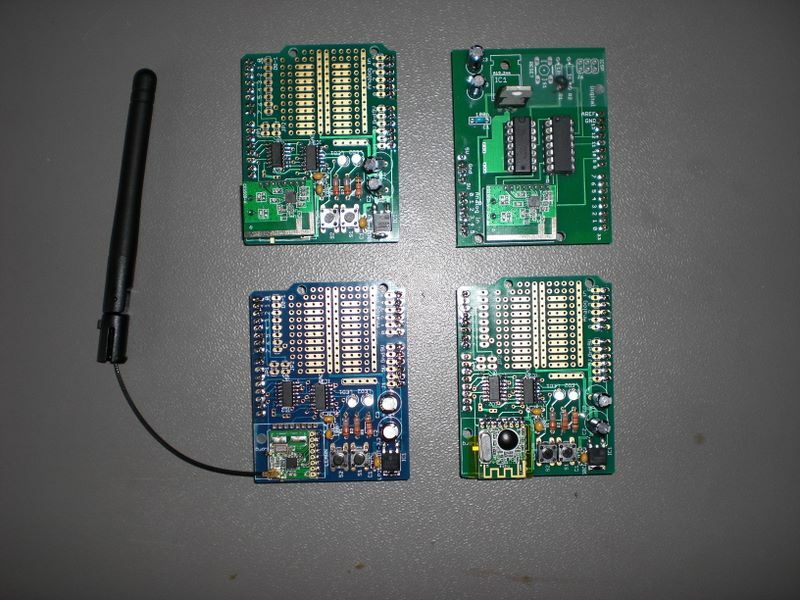 Clockwise from top left, the V05 shield with socketed module, the original protoype, the V06 shield new with new CC2500 module and the V05 shield with external antenna. Author adminPosted on August 14, 2010 December 13, 2015 Categories Kits, LivingColors Gen1, PCBTags Arduino, Arduino Shield, CC25001 Comment on Arduino CC2500 shield versions. The kit described ONLY works with the 1st generation LivingColors which is no longer sold. I have made newer and slightly changed versions of the shield. Little changes as far as assembly is concerned. The software has changed : it has been upgraded to Arduino 1.0 and the output power has been increased. Do NOT use JP1 en JP3 unless you understand what the do and how you intend to use them. They can be used for interrupting the Atmel when packets have been sent or received by the CC2500. This would require changes in the library. The via’s of the surface mounted module are too close to the metal USB connector of the Arduino. The via’s are tented but it is best to punt some tape on the PCB just to be on the safe side after assembling the shield. 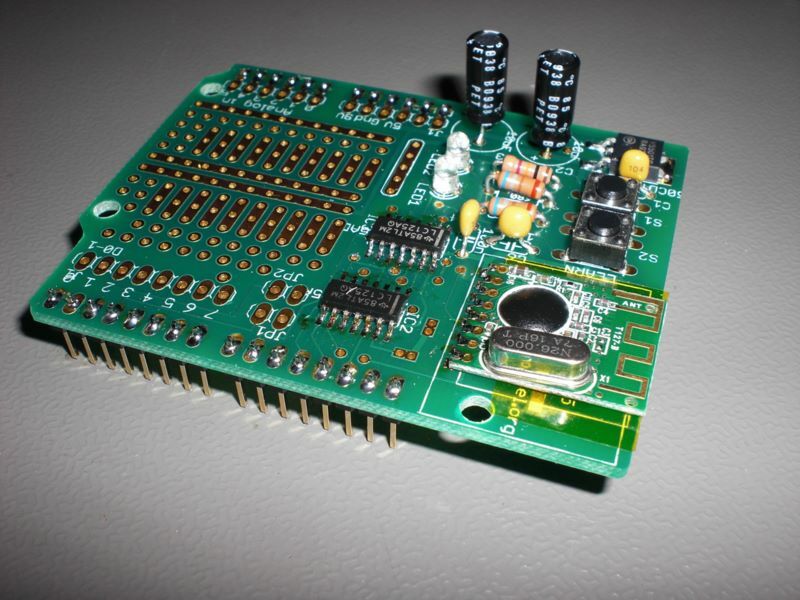 The CC2500 Shield for Arduino is a kit that interfaces an Arduino to a CC2500 radio transmitter – receiver. 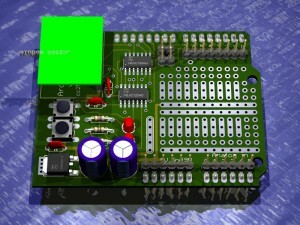 An Arduino or Arduino clone like the Freeduino. Standard tools and skills om needed to assemble an electronics kit. At least you will need a small soldering iron, soldering tin, and diagonal cutters. A multi-meter is useful for finding errors and some solder wick or a solder vacuum. You can find various guides on how to use these tools. Smallest parts first. In this case the two 74LVC125 and the DPAK voltage regulator. If you are assembling the version of the CC2500 module with the eternal antenna, you should solder it now. Check the alignment with the holes in the PCB and the notches on the module. If you have the module with the internal antenna, now is the time to solder the 8 pin header. Solder the rest of the parts. Make sure the IC’s are mounted correctly, pin 1 should be near the 8 pin header. There are two different values resistors on the board. R2 and R3 are 680 Ohm, R4 is 10k Ohm. There is no R1. The LED’s should be mounted with the cathode (the short pin) in the ground plane. The short pen should be near the prototyping area, the long pen near the resistors. Do NOT mount JP1 and JP3 unless you know what you want to use them for. There is no JP2. I have made a couple of clips showing how the prototype was assembled. Mounting the SMD’s part 1. Mounting the SMD’s part 2. The LED’s and the 8 pin header. After mounting the parts it is best to check a few things. Check the top and bottom of the board for shorts and faulty connections. Use the multi-meter to check for a short between 5V and GND on J1. 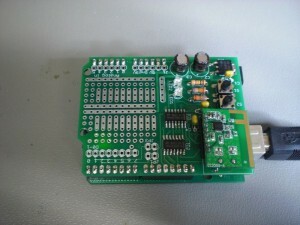 After that you can put the shield on the Arduino without the CC2500 module (if you have the internal antenna version). On the header for the module you should check the voltages. You should measure 3.3 V between pin 6 and pin 1. You can use the cut off pens of the LED’s to put in the 8 pins header. S1 should reset the board. If everything checks out you can remove the shield from the Arduino, place the CC2500 module on the shield and put the shield back on the Arduino. 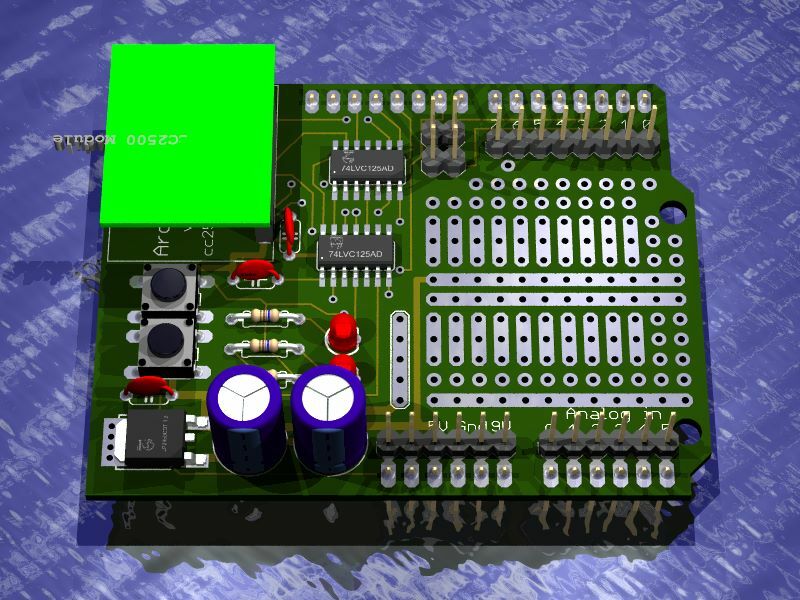 Eagle3D allows you to render an image of the board.